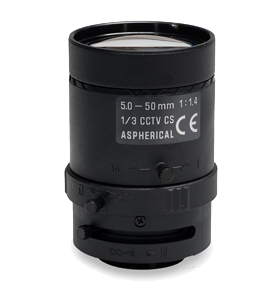 Featuring a horizontal angle of view of up to 5,6°, this lens was clearly designed for outdoor applications. This lens is your first choice for applications such as number plate recognition in traffic surveillance, when you need to capture small details in good magnification or for the monitoring of entrance gates, when your object is far away. The Tamron patent multi-layer coating ensures that reflections caused by head or street lights are reduced to a minimum. A special Tamron ND-filter is integrated in the iris and reduces aberrations caused by diffraction under very bright lighting conditions. An aspherical lens element ensures the high quality image resolution, even under low-light conditions and with a fully opened iris. The combination of both technologies makes the 13VM550ASII the perfect lens for outdoor use, with excellent image quality from the low-light conditions of twilight to the brightest sunshine. Available with manual, DC and Video auto iris.